Managing what I have stored in the pantry, fridge and freezer can seem like a full-time job, at times. I'm diligently trying not to waste, as well as provide interesting meals for the family. Over the weekend, I noticed that I had a surplus of eggs, green peppers, sprouting potatoes, onions and cheese in stock. I considered the different possibilities for using these up quickly, and decided on breakfast casseroles for upcoming holidays. I assembled 3 casseroles (each will serve 4-6 people), one for Christmas breakfast, another for New Year's breakfast, and a third to use for supper some evening this month. There are numerous freezer breakfast casserole recipes online. 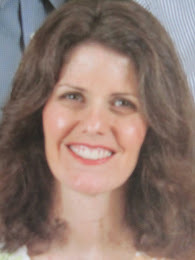 I'll tell you how I did mine, and maybe it will spark some ideas to use up your surpluses. I buttered three 8 X 8 inch square aluminum pans. I peeled about 11 small potatoes, and grated them in the food processor. 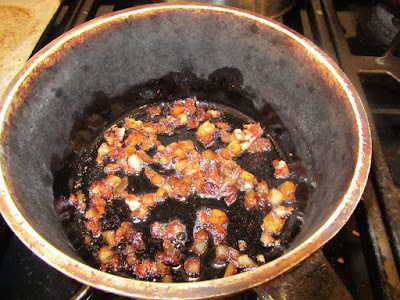 In a non-stick skillet, I par-cooked the grated potatoes in some oil, stirring constantly. I'd say the potatoes are about halfway cooked. I recall a couple of recipes that call for frozen hash browns, so I was attempting to duplicate these with the par-cooking in oil. I spread the potatoes in the 3 pans. I had 2 green peppers and 1 onion, which I chopped and cooked in a little butter, till the onions were translucent. Then combined these with the potatoes. I added some grated cheddar, and tossed all together in the pans. In a large bowl, I beat 10 eggs, 2 cups milk, some salt (I think about 1 1/2 teaspoons), and black pepper. Poured this over the potato/vegetable/cheese mixture. Then topped with a bit more cheese. 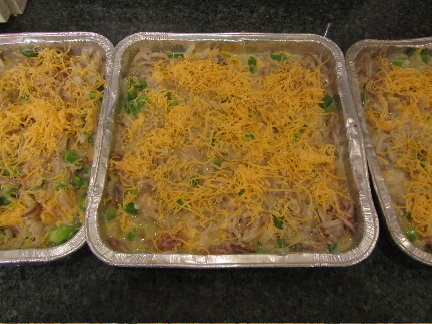 In total, I think I used about 1/3 pound cheese for these 3 casseroles. I considered adding ham. But decided we'd have grilled ham, on the side, with these casseroles. Breakfast casseroles would also be delicious with cooked sausage added, chopped tomatoes, and bread cubes or cooked rice substituted for the potatoes. I covered all three casseroles with foil and froze. I've got them separated for now, until frozen solid. Once totally solid, I'll stack them and put in a large plastic bag. When it comes time to bake these, I'll thaw overnight in the fridge. Then, bake, uncovered, at 350 degrees F, for 25-30 minutes, or until a knife inserted in the center comes out clean. I have some other items in the fridge that I'd like to use up. Later this week, I'll assemble a couple of lasagnas for the freezer with those items. Like I said, managing the supplies sometimes feels like a job in itself, don't you think? I definitely like sausage in my breakfast casseroles, but ham on the side sounds good too. Me too. I like crumbled sausage in mine. But I decided that with the ham I'd rather have it on the side so I get it's full flavor. YUM! that sounds like a keeper recipe. Good planning on your part, too. Thanks, Carol. 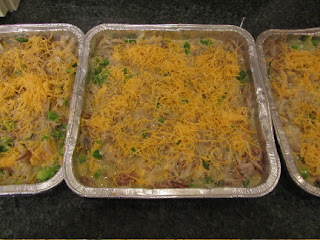 I love having casseroles ready to go in the freezer. That looks delicious! When I realized I could make breakfast casseroles I about flipped. Suddenly, I discovered the wonders of brunch at my place (and the leftovers I could take to work). Stratas and other breakfast casseroles are great vehicles to use up leftovers. Oh I know what you mean. You can add all sorts of things to these sort of casseroles. Problem is, my hubby has our freezer so full with produce and venison/salmon/turkey/ham that there is no room for a casserole. I have a recipe for an overnight egg casserole in the crockpot which I am toying with trying for Christmas morning--have you tried anything like this? It has great appeal to me to mix up everything the night before and be done with it. It's also our tradition to have homemade cinnamon rolls Christmas morning but I like to serve something more substantial as well (all that sugar and white flour doesn't satisfy me for long--I only like my cinnamon rolls with white flour; I've tried the whole wheat version and it just doesn't do it for me, especially since this is a once-a-year indulgence). I know what you're talking about. All November our freezers were so full I couldn't make anything ahead and freeze. We're just now making a dent in the stock there. That crockpot egg casserole sounds like it's worth trying. I'm the same way about Christmas breakfast, just sugar doesn't work for me. So I plan something with protein, like this casserole. We'll have ham and blueberry muffins, with it. But I like to just sit and enjoy the morning with the family, and not be spending it in the kitchen. Let me know how the crockpot casserole works out. The idea of putting it together in the evening and just leaving it to cook itself, sounds very appealing. yes, you can freeze raw eggs. In recipes such as breakfast casseroles, you usually mix the eggs with milk or other liquid. They bake up just fine, without any noticeable change in texture. According to Betty Crocker, raw eggs are freezer stable, especially if mixed with something else. In quiche's, I always bake before freezing, so the crust stays crisp. You can freeze raw, beaten eggs for baking later, but according to Joy of Cooking, you should add some sugar or salt to each egg. I've done this when I've had a surplus of eggs to use up before expiry. It worked just fine. The eggs look slightly different when thawed, but once mixed into a batter, they work just fine. oOOO, a whole new world of meal management has opened up to me! Thank you.